As the family welcomes loved ones into their home, this bountiful fruit basket offers your caring support in a tangible way. 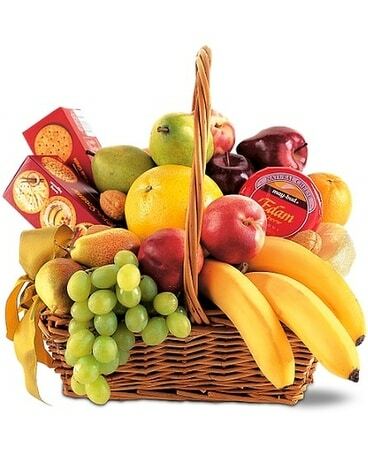 One wicker basket with handle arrives filled with fresh apples, grapes and bananas, along with cheese and crackers. Approximately 16-1/2" W x 13-1/2" H All of our bouquets and gift baskets are hand-arranged and delivered locally by professional florists. This item may require additional lead time so same-day delivery is not available.